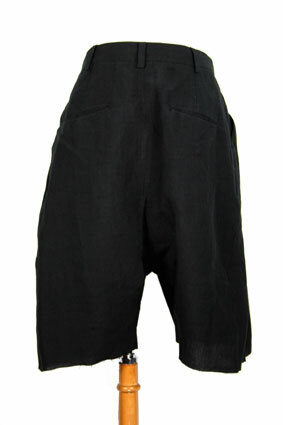 Masnada black line shorts (Masnada call them Pants-Skirt. Pull-across front with 2 button fastening at an angle and off-centre. 2 pleats on right side and 1 pleat to the left. 2 side pockets and 2 rear pockets. Lowish crotch. Raw edged hems. Really beautiful summer shorts.